This is a great way to fix bacon ahead of time. Fix it on Christmas Eve and on Christmas morning, you just pop it into the over. You can serve it with Over-Night French Toast or mix up pancakes while it is cooking. This bacon is sweet with brown sugar and tangy with Dijon mustard. If you have a grill pan, use it while making this recipe. Grill pans are pans made from a heavy material, usually cast iron, that have raised ridges all over the bottom. When you cook bacon in a grill pan, the fat drains down below the ridges and the bacon stays up top. These types of pans are great for hamburgers, fish, and chicken breasts as well. The ridges make those nice grill marks like you see in restaurants. You can find these pans in kitchenware stores, but department stores carry them as well. If you don’t have a grill pan, just use a flat-bottomed pan. A grill pan is ideal for this bacon recipe, but a heavy skillet works okay. The night before, cook the bacon in a grill pan over medium-high heat until it’s three-quarters of the way done. This should take about 3 minutes on each side. The bacon should be just starting to brown and have released most of the fat. Drain the bacon on paper towels. 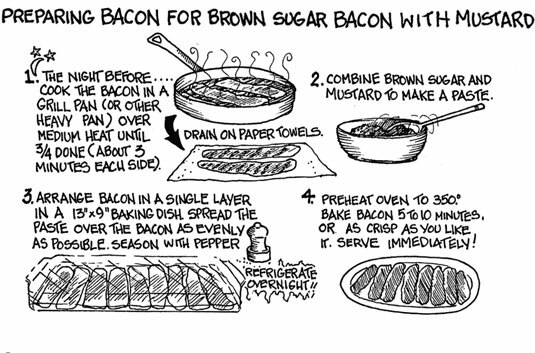 While the bacon is cooking, combine the brown sugar and mustard in a small bowl to make a paste. Arrange the bacon in an even layer in a 13 x 9-inch baking dish. Spread the paste over the bacon as evenly as possible. Season with pepper. Cover with plastic wrap and refrigerate overnight. Preheat the oven to 350 degrees. Bake the bacon for 5 to10 minutes, or until it’s as crisp as you like it. Serve immediately. Per serving: Calories 164 (From Fat 117); Fat 13g (Saturated 4g); Cholesterol 21mg; Sodium 463mg; Carbohydrate 5g (Dietary Fiber 0g); Protein 8g.